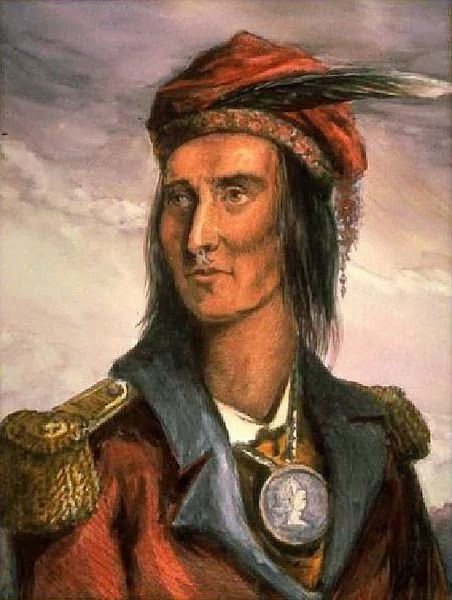 While researching my book Heart’s Heritage, one of the more interesting historical figures I encountered was the Shawnee war chief, Tecumseh. Born in 1768 near present day Chillicothe, Ohio, Tecumseh rose to fame as a prominent leader among the Native American tribes of the old Northwest Territory. In the Shawnee language the name Tecumseh means either “Shooting Star,” or “Panther Across the Sky.” The second definition seems more likely as his father belonged to the Panther clan of his tribe. Living up to his name, Tecumseh spent his life in a fierce campaign to repel the migration of white settlers into the western lands. When Tecumseh was still a boy, his father was killed by white frontiersmen who entered Shawnee lands in violation of a treaty. This seminal event may well have triggered Tecumseh’s determination to drive the white man back to the eastern seaboard. At the age of fifteen, Tecumseh joined a group of Shawnee that regularly attacked flatboats carrying white settlers down the Ohio River from Pennsylvania. 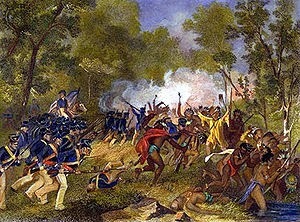 During the American Revolutionary War, the Shawnee allied with the British to fight the American settlers. 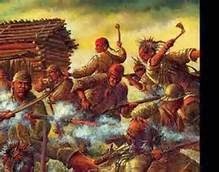 At the end of the war, Tecumseh continued to battle the Americans, joining the Wabash Confederacy, a group Native American tribes of the Northwest Territories that banded together in an effort to push back the ever encroaching white settlers. 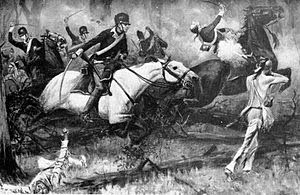 Tecumseh took part in many battles including the Battle of Fallen Timbers against General “Mad” Anthony Wayne in which, Wayne prevailed. But unlike Tecumseh and his brother, not all leaders of the Ohio tribes saw violence as the best way to deal with the settlers. Shawnee chief Blackhoof, worked to maintain peaceful relations with the whites. So when Tecumseh and the Prophet’s warlike rhetoric began causing tension between the Indians and the settlers, Blackhoof insisted that the brothers leave Ohio. Tecumseh and the Prophet moved west to Indiana Territory near present day Lafayette, Indiana, and established a Shawnee village they called Prophetstown, now an Indiana state park and historical site. 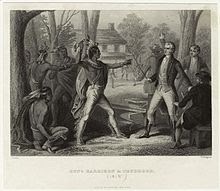 In 1810, Tecumseh had a contentious meeting with Indiana Territory governor, William Henry Harrison and demanded that Harrison rescind earlier land purchase treaties. Harrison flatly rejected Tecumseh’s demand, enraging Tecumseh. Violence between Harrison’s men and Tecumseh’s braves was narrowly averted when a chief of the Potawatomi tribe urged the warriors to leave in peace. The peace was short-lived as Tecumseh traveled south down the present day states of Indiana and Kentucky, recruiting Native American tribes to join him in warring with the white settlers. 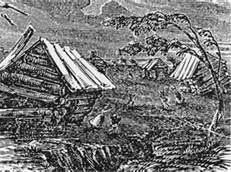 In 1811 two natural events occurred, helping Tecumseh in this endeavor. In March of that year, a comet streaked across the sky. Since his name meant “Shooting Star,” Tecumseh as well as Indians of various tribes took the sign to mean that the Great Spirit had indeed sent the Shawnee chief to unite the tribes against the settlers. Then in December of that same year the New Madrid earthquake shook the entire Midwest, convincing the tribes that the Great Spirit wished for them to support Tecumseh ﻿and the Prophet. 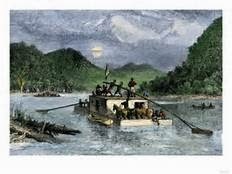 known as the Battle of Tippecanoe. After that defeat, the Prophet is said to have placed a curse on Harrison who, years later, died a month after winning the 1840 election for President of the United States. For the next hundred and twenty years, every president elected in a year ending in zero died in office. 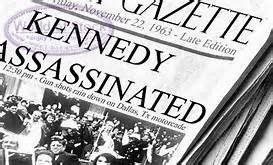 This month Americans will observe the fiftieth anniversary of the assassination of President John F. Kennedy, elected in 1960. This phenomenon, which has been called the “Zero Curse,” was finally broken when President Regan, elected in 1980, survived an assassination attempt. 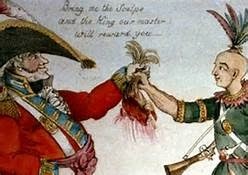 When the War of 1812 broke out, Tecumseh again allied with the British, who paid five dollars for each white American man’s scalp and three dollars for the scalp of a woman or child. Tecumseh’s campaign became a bloody part of the larger war. 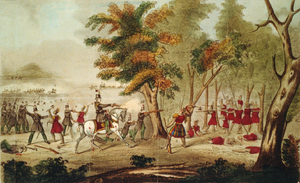 Tecumseh finally met his own demise in 1813 at the Battle of the Thames, which took place between British and American forces in Upper Canada. 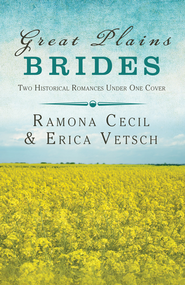 Leave a comment for a chance to win a copy of Great Plains Brides, a compilation of Ramona K. Cecil's book A Bride's Sweet Surprise in Sauers, Indiana and Erica Vetsch's book A Bride's Portrait of Dodge City, Kansas. Great post! It's hard to believe that a country like Britain would stoop to asking for the scalps of not only men and women but innocent children. That was shocking to me. Thanks for the information. Hi, Debbie Lynne. It is surprising, but yes, they did that during the Revolutionary War as well. My current work in progress is inspired by just such an event that happened in southern Indiana in 1812. Life on the frontier was perilous during those times. Ramona, this is a riveting piece of history. I got cold chills reading about the presidents who died in years ending in zero. While I realize your post is about a brave man trying to save his people, I can't help but admire President Reagan even more than I always have. Surely he was God's man in his time. Hi, Louise. Thanks. I agree. I only learned about the "Zero Curse" a few years ago. Like you, I believe God protected President Reagan for America's sake. I remember reading about Tecumseh and other Indians in American history, but didn't remember some of the details you posted. I have always heard that about President's elected in a year ending in Zero, but didn't know where it originated. That's a fascinating tidbit. I agree with Louise about Reagan. Hi, Martha. I would rather believe that the Prophet's curse had nothing to do with the deaths of all the presidents who were elected in years ending in zero, but it is an astounding coincidence. Whatever the reason, I do agree with you and Louise about President Reagan. Ramona, Your information about Tecumseh and his part in history was very interesting. I must admit even though I live in Ohio I was not familiar with all the details you provided. I love history but I am not as informed about Indian history as I would like to be. Also I have never heard about The Zero Curse and I find that astonishing as I'm a senior citizen! Thank you so much for the history lesson and giveaway your book would be a pleasure to read! I will also check into Heart's Heritage. I agree with Martha And Louise Regan was excellent president. Hi, Jackie! I remember learning about Tecumseh and the Prophet as a school girl, but that was many moons ago. LOL I learned a lot more in my research of Heart's Heritage. I find that time in history fascinating. Hope you get a chance to check out Heart's Heritage, and good luck in the drawing for Great Plains Brides! Thank you for this post. I have read a couple of books about Tecumseh and have enjoyed the. Thank you for the chance to win. Hi, Angela! I find Tecumseh and his brother the Prophet fascinating. I haven't yet visited Prophetstown near Lafayette, Indiana yet, but it's definitely on my list of "must see" places. Good luck in the drawing for Great Plains Brides! Hi Ramona! You have included so many fascinating tidbits in this post! I learned several things about Tecumseh that I didn't know. Also, I had never heard of the "Zero Curse" before. So interesting! Hi, Britney! I first heard about the Zero Curse maybe a dozen years ago. One of those "stranger than fiction" things. Coincidence? I prefer to think so, but there are dark forces we can't discount. I'm glad you enjoyed the post. Thanks for stopping by, and good luck in the drawing for Great Plains Brides! Enjoyed reading the history of Tecumseh and his brother - I love Native American history and that time era. I knew some of the things you posted about these two brothers, but not all of it - thank you for sharing it! The book you have sounds interesting just from their titles. Thank you for the giveaway and God's blessings to you! Hi, Lori! Glad you enjoyed the post. I love the frontier era, especially in Indiana and the surrounding Ohio Valley. When I travel the wooded hills of my southern Indiana, I can easily imagine Indian braves luring in the forests along the roadside. I love bringing those images alive in my stories. 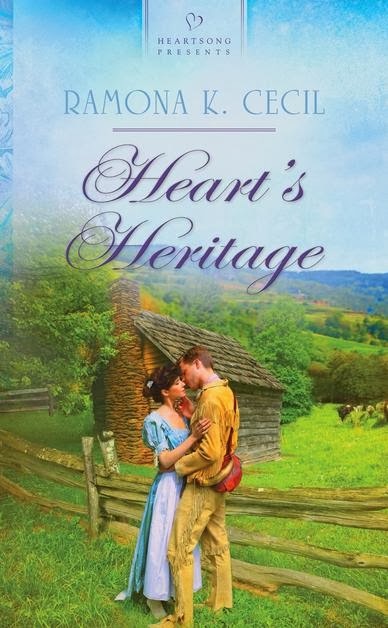 Heart's Heritage gives you a peek into frontier Indiana. Hope you get to check it out, and good luck in the drawing for Great Plains Brides! Ramona, what a great post! It was so very interesting. Thank you for sharing and thank you for a chance to be a winner! Hi, Melanie! Glad you enjoyed it. :) I love sharing Indiana's colorful history, and Tecumseh and his brother the Prophet are certainly among Indiana's most interesting historical figures. Thanks for stopping by, and good luck in the drawing! Hi, Eliza! Glad you liked the post. I'm assuming you live in/near Lafayette, Indiana. One of my joys is reading about and sharing tidbits of Indiana's rich and colorful history. Good luck in the drawing for Great Plains Brides! Good information on Tecumseh, who I'd forgotten much about him. Hope to win your book, Great Plains Brides! Thanks, Sharon! I'm glad you enjoyed the post, and good luck in the drawing for the book. Loved this post, Ramona! Learned some interesting facts - I've never felt the Indians were treated fairly, and while - I don't think violence was the answer, they deserved more respect, re: their land, than they were given. I am a descendant of Marmaduke VanSwearingen, who for years has been known as Blue Jacket. He supposedly was captured by the Shawnee, & made a war chief, because they were so impressed with his bravery. He was wearing a blue jacket when captured, hence, the name. There was an outdoor drama re: his life, that ran in Lima, Oh., for over 25 years. A few years ago, a dispute ensued - claiming Blue Jacket was not Marmaduke, & that DNA from descendants have proved this. I don't guess we will ever know, for sure, but no other explanation for the disappearance of Marmaduke has surfaced. Hi, Bonnie. Wow! Yes, I am familiar with the amazing story of Blue Jacket. What an interesting family heritage you have! I agree that the Indians were not treated fairly in many cases. Anyone who is not acquainted with your ancestor's fascinating story should check it out. Thanks for stopping by, and good luck in the drawing! I really enjoyed reading this. I love the Indian stories. Always have. Hate the way the whites treated the Indians like they had no rights when they were here first. I would love to win this book. Thanks Ramona for the give-away. Hi, Maude. I love the Indian stories, too. I think you'd enjoy Heart's Heritage. I hope you get to check it out, and good luck in the drawing for Great Plains Brides! I did find that fact surprising, too, Susan. They did that during the French and Indian war(I think the French did it too) as well as the Revolutionary War and the War of 1812. The American frontier could be a very brutal place, especially during these wars. When you begin to delve into the research, some of the true life stories are more fascinating than fiction. Thanks for stopping by and good luck in the drawing for Great Plains Brides! You did a great job with the history. Thanks, Chris! Good luck in the drawing for Great Plains Brides! Great post Ramona, I really enjoyed learning about Tecumseh. Thank goodness getting paid for bringing scalps isn't a practice that still goes on during battle. That's wicked gross! Thanks, Kam. I agree about the scalping. It was a brutal practice during a treacherous time. "Wicked gross" pretty much covers it. Nice article and research. As an added note, the "T" in General William T. Sherman (of civil war fame) stood for Tecumseh. His father named him after the Shawnee war chief. Don't you just love finding out all these facts? I'm currently reading the memoirs of General Sherman. Fascinating recount of history.